While beginning a season 0-3-0 does not a happy fan base make, Sunday's win over Philadelphia has some Chicago Fire fans feeling at least a little better about the team's rebuilding process. Throughout the beginning of the season, coach Frank Yallop has frequently stressed that the team needs time to adjust to each other. After all, they brought in three new designated players during the off-season, and are returning players who accounted for only 63% of last year's minutes (the league average over the last four seasons is around 71%). It should take a while for all of those new pieces to mesh from the somewhat disjointed side we've seen into a coherent whole. But, given the Fire's level of roster turnover, how long should we expect the meshing process to take? The term “meshing” is a slippery one, and can be defined in any number of ways. Is it when a team's roster turnover no longer informs its results? Is it when a team's results sufficiently indicate its performance for the rest of the season? Is it when a team reaches the level of performance it will remain at throughout the rest of the season (if, in fact, a team can ever be expected to do so)? Each of these definitions could be argued as valid, and I'm sure there are many other possible definitions not considered here. As it stands, though, these are the three I will analyze, using MLS data since 2011, in hopes of arriving at an answer to the question of how long it takes a team to mesh. Let's start with the first definition- meshing defined as the number of games in which roster turnover still directly informs a team's results. 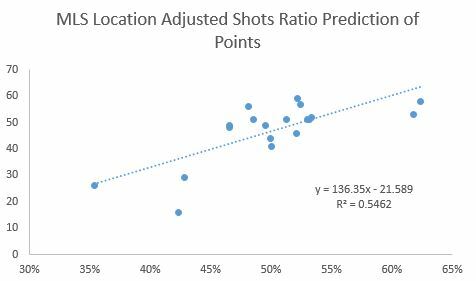 This graph shows the correlation between points after x number of games and the percentage of a team's field minutes returned from the previous season. 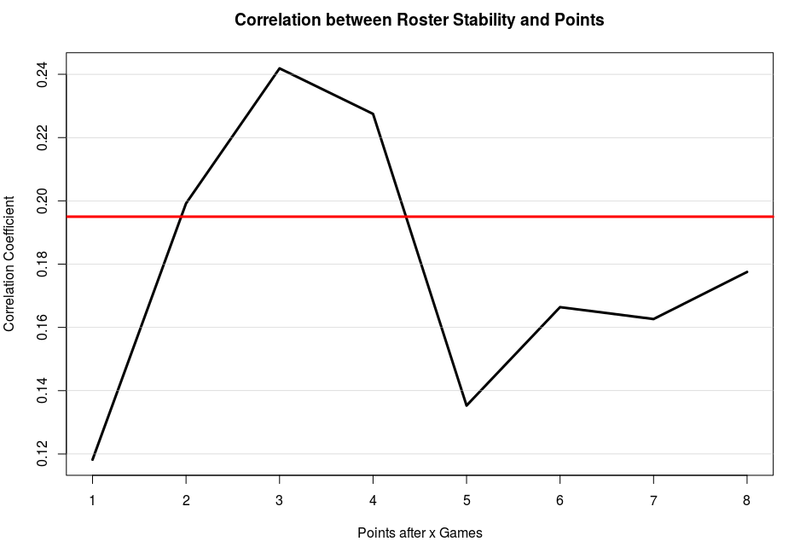 A positive correlation suggests that as roster stability increases, so does points earned. Numbers below the red line are not considered statistically different from zero (at 90% confidence). Note that the correlations in general aren't huge, but they do exist. 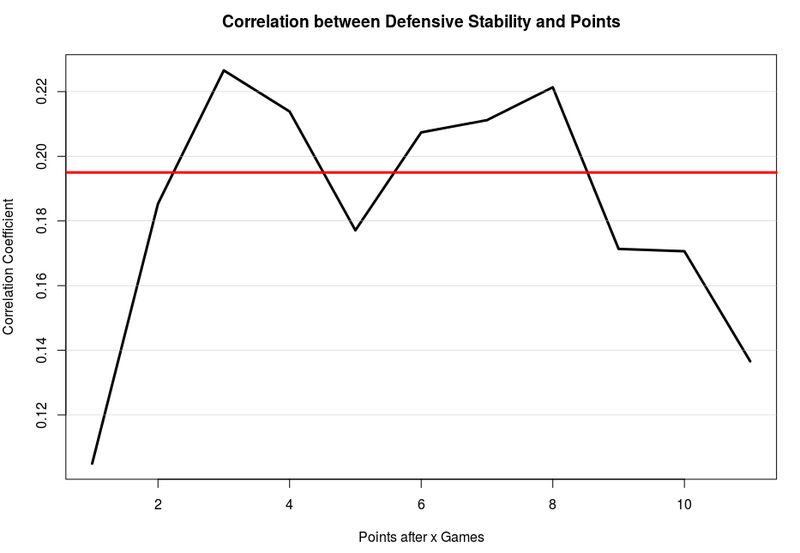 As you can see, the correlation between roster stability and points peaks at game three, and remains statistically significant until game five (after which it remains insignificant until close to the end of the season). These two graphs, then, suggest (though perhaps not convincingly), that it may take as few as three or four games for a team in general to mesh, while it may take as many as eight for a defensive unit to come together. Now let's take a look at the second definition- meshing defined as the point at which a team's results through some number of games “sufficiently” indicate what its results will look like for the rest of the season. To do this, I've split teams into two groups- those with “high” roster turnover (in the top 50%), and those with “low” roster turnover (in the bottom 50%). I then regressed the team's final points total on the team's points total after x games, for each of the two groups. The Rsquared values for each of these regressions are graphed below, with the linear models from the set of all teams included as well. So essentially what we are looking at it is how well we can predict how a team will finish the season, based on what they've done after a given number of games. Through six games, each game is about as predictive for each group, meaning that how well a team with high roster turnover does through six games is just as indicative of how that team will finish as how well a team with low roster turnover does through six games. That is to say, we don't gain any extra predictive power by knowing a team's level of roster turnover. By game seven, though, high turnover teams begin to out-pace low turnover teams- by game seven we have a better idea of how high turnover teams will finish the season than low turnover teams. By game nine, the R2 value for high turnover teams is at .546, which is pretty high. We would expect predictions made using this nine game point total to be on average only about seven points off the final season total. That gets us pretty close for being barely a quarter of the way into the season. Though it's a normative statement not a positive one, and you could really draw the line anywhere, I would probably suggest that nine games is as good a place as any to set the limit on meshing based on our second definition. At the very least, we can say that after nine games we should have a decent idea of whether the rebuilding process will be successful in year one. Finally, let's turn our attention to the third definition- meshing as the point at which a team reaches its consistent level of performance. Let's investigate this phenomenon a little bit. Here's a graph of the three game rolling expected goal difference (at x = 4, the value on the y axis is the xGD from games two, three, and four, for example) for Sporting Kansas City last season- a decently representative mid-table team. Expected goal differences provide a pretty reasonable statistic for gauging how good a team is. It's pretty much all over the place. These graphs point to something which I think is an important (though perhaps obvious) point to make; it's mostly unreasonable to expect game by game measures of a team's strength to converge over the course of a season. 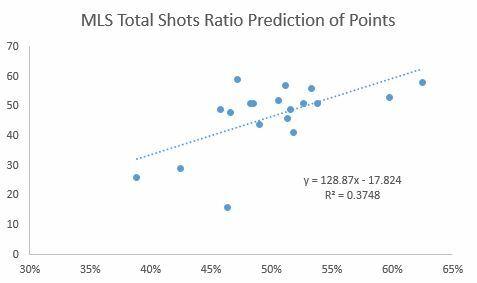 (Metrics like xGR (expected goal ratio), TSR (total shot ratio), and points per game will converge, but usually only when they're being calculated on aggregate.) There are a lot of reasons for this. Injuries, international call-ups, strength of schedule, and mid-season transfers are all factors which affect a team's consistency of performance. Teams, save maybe the very dominant and the very bad ones, just go through peaks and valleys throughout the year. They have good games and bad games. What does this mean for meshing, then? Well, we've already seen that how a team performs at the start of the year can be predictive of where it finishes, particularly for teams with high turnover. The point above, though, suggests that how a team starts the year isn't necessarily indicative of how it will perform throughout the year. For teams who haven't quite come together yet, then, there is certainly still hope of righting the ship. Given the above analysis, I would expect the effects of having new players brought in to the system to begin to wear off by game four or five (though this may take a bit longer this season because of international call-ups). By game nine or ten, a team should have a decent idea of how well it has done in rebuilding its roster. If things remain bleak at that point, there is still the possibility of finding some success, but it may come only in limited doses.